Rawai Muay Thai was the first Muay Thai training camp to open in Thailand that specialized in teaching foreign Muay Thai fighters. 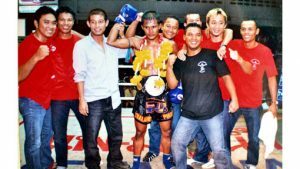 Since 2003 Rawai Muay Thai has produced champions and helped thousands of people achieve their health and fitness dreams. Our Muay Thai training is not just tailored to helping professional and upcoming fighters, but also to help anyone looking to lose weight, shape up, relieve stress and start feeling good about themselves. There are a lot of health benefits to Muay Thai training such as improving fitness, increasing stamina, losing weight, increasing muscle, and getting fighting experience. It’s OK is you have done little to no Thai boxing before. We accept students of all levels and ages. The Muay Thai classes offer an intense workout and are, most of all fun. So before you know it, the class is over and you are sweating and tired and amazed at what you just achieved. Book in advance for Sunday times. Private lessons take place in between the group classes. Each private lesson lasts about 1 hour and costs 700 baht. On Sunday you can do private lessons, but you need to schedule them in advance with your trainer. Learn the ancient martial art of Muay Boran including the beautiful Wai Kru dance performed at the beginning of Muay Thai fights. Take advantage of our excellent teachers to learn the tricks of the trade. This course is intended for intermediate to advance students. Read testimonials from students who have taken the Pad Holding course. 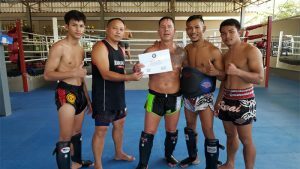 Read posts about students who have done the fight training program and had a fight for Rawai Muay Thai. Keep up to date with fight results. Yoga will keep you flexible and strengthen your core. This in turn helps prevent injuries and complements your Muay Thai training well. I was looking at going to a gym in Phuket until a friend recommended Rawai. I can honestly say that if you are looking for a Muay Thai camp, this is the place to go. No heroes, no ego, just a great family/team environment. I took my wife and 6 yo son with me and they also loved it. From the first email to Diana I was made to feel welcome. The trainers and staff are kind and polite. I learnt so much, in Muay Thai and life lessons. I met so many amazing people I will be friends with for life. 100% coming back! My only complaint is that I had to leave. Thank you guys. Until next time.